Not everyone has written an academic piece before, or the last one they did was in the pre-internet era (like me), so I thought I would jot down a few practical tips I learnt along the way when I was writing mine, that might save others a few headaches and wasted time. They are my personal recommendations and partly reflect my own style, so follow your own process of course! Read good modern literature and good writers in similar genres to your thesis – this is the most fun way of learning to write well, and it actually works (although it works over a longer time frame, whereas a writing course is more immediate). 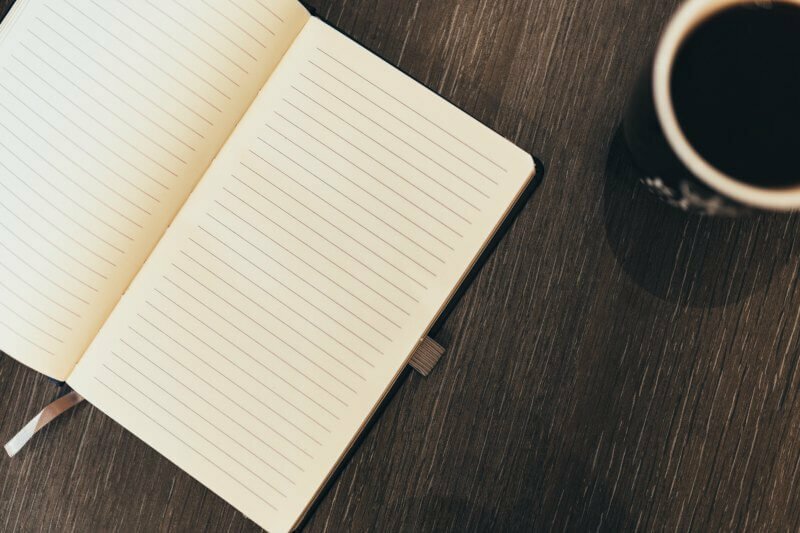 It may not make you a great writer, but it should help you feel more comfortable with writing which makes a huge difference. Read – Not Drowning, Waving! : Process Work Research Design and Supervision in Uncharted Waters by Lee Spark Jones and Planning A Final Project by Lee Spark Jones, Ph. D. (they both used to be on the PWI website but I don’t see them there anymore and they are not mine to publish online, so ask around. I think the first is the updated version of the second, but the second has a cool intro so I recommend reading both if you can get them). Work out who your thesis supervisor will be and negotiate terms for paying for their reading time etc. You want to feel really free to send them stuff for feedback; so do this with an explicit agreement about how and what they are charging for their time. Also, negotiate if they will review chapter/chunks at a time or only a full draft. I didn’t make much progress on my thesis until I set a serious deadline. It might not be your process, but it worked for me. If you do set one, base it on a series of milestones (mini/sub-deadlines) that need to be achieved to get to final submission, so it’s a staged plan, not just one big deadline. Look ahead in your diary at upcoming commitments to make sure it’s realistic. I made a colour-coded table in Word to document my timeline. Set yourself a reward for finishing if that motivates you (although finishing your thesis is a big reward itself). 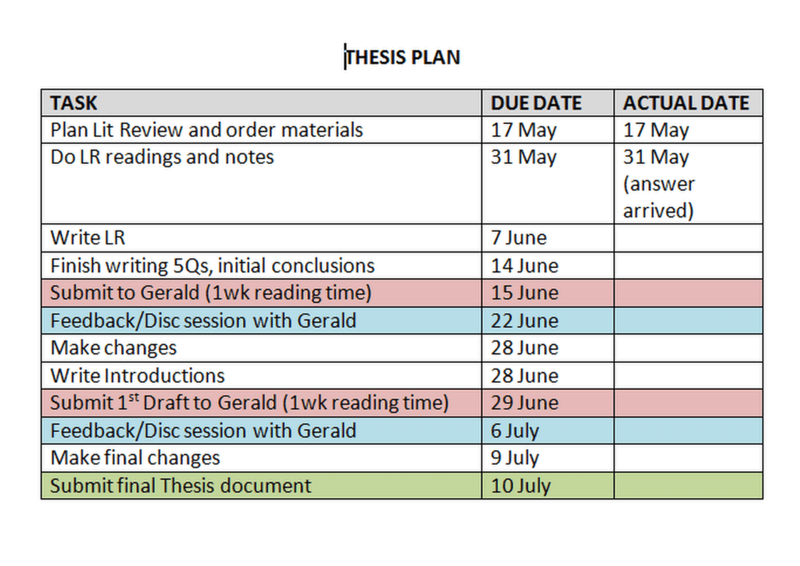 Share the plan with your thesis supervisor and check in with them if this timing will work for them; how much time between submitting draft material and feedback/discussion sessions do they need; are they planning any absences during your writing phase when you want to be able to call on them etc? If they are planning significant absences and won’t be able to work with you during the absence, either find a new supervisor or redo your plan – whatever is right for you. Know what referencing method you will be using (Harvard is pretty standard, but double check in your student guide or with your thesis supervisor). Reference as you go!! Don’t read lots of stuff and make lots of notes and think you’ll reference later – it’ll be a nightmare. I used citethisforme.com which was great (I didn’t create an account, just copied and pasted each reference into my notes as I went along), but there are others out there too. As this is a small thesis, I didn’t bother with any of the super-amazing online tools for research management, figuring they would be more hassle than they were worth, but you might like to check them out. My old phone couldn’t do it, but many phones can use a library app to scan the barcodes on books to create references. In ‘citethisforme’ you have to type in the ISBN or title, so it’s not a laborious option if the phone thing doesn’t work. If you’re using DIRECT QUOTES, you must also cite the page number, so as you collect quotes make sure you note the page number. If you miss some, GoogleBooks can sometimes help (look up the book, then look up words or phrases from the quote and sometimes it can return the page number for you, sometimes not). For my Lit Review, I had a separate Word document to collate quotes from each author/paradigm I was reading about and would put the full references in the document, plus page numbers for direct quotes I was copying. I only put references into my bibliography document as I used them in the actual thesis, not during the Lit Review stage – this makes it almost foolproof that your listing will be accurate – but you still need to edit your final thesis to make sure the in-text citations match with the bibliography. Little sticky page markers are great for marking important pages in books, especially if you don’t own the book and therefore can’t write in them (even then, sticky markers are handy). In Adobe Reader (for pdfs) there is a highlighter tool and a comment tool for doing the same thing in online documents. I’m a fast typer, so typing notes from books worked for me. If you’re not, you might want to explore some kind of electronic note thingo where you can hand write onto a tablet and it translates into text; or a voice-to-text program like Dragon Naturally Speaking (not cheap though), and there are heaps of apps for converting speech to text. There are also some programs/apps where you can scan sections with your phone to convert to text. Or you can just handwrite them as you go and lament not learning to touch-type in school! Your thesis may not require a huge Lit Rev (especially if it’s an exegesis of a project or performance) so no drama there (pun intended ;). In the drafting stage I used separate Word documents for each chapter. This makes navigating around the document much easier in the drafting stage. Don’t put page numbers on at this point – do it once you have compiled all the chapters. In the compiled document you may need to use Section Breaks so you have more control over automated page numbering – but avoid them if you can as they can sometimes be a pain. Working in separate chapters also helps with a sense of, and tracking, progress. I also created a “Flotsam” document for each Chapter. This is where I put any chunks of writing or quotes that I had written but then decided to take out. Don’t delete them! Save them in another file just in case you change your mind. There are several reasons to use Word’s Style Set functions; saves you time formatting your heading hierarchy manually; should prevent style errors; means you can automatically build a contents page instead of typing and formatting it manually. You can either use the preset styles (if they are acceptable formatting, check with your supervisor about this) or create your own. I won’t go into details about how to use it – jump onto YouTube or Google and check out some tutorials. 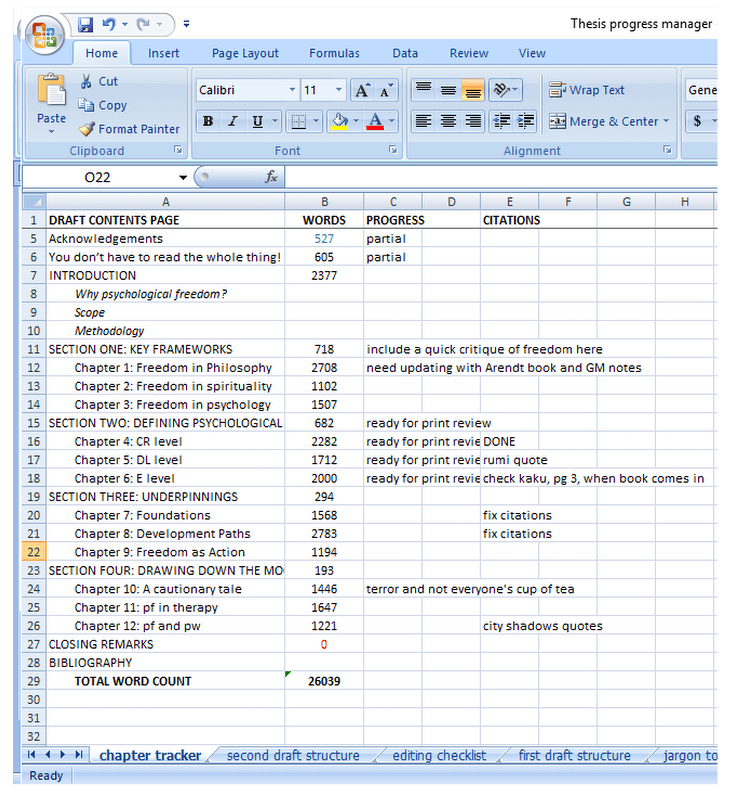 I created a spreadsheet in MS Excel that listed the chapters, the word count, what stage of drafting they were up to, outstanding tasks etc. Excel can look intimidating but it’s not that complicated to use. If you’re not familiar with it, watch a couple of basic tutorials on YouTube and it’s all you’ll need to use it for this application. But of course you can track progress however you like, but I recommend doing it – I found it very comforting to track progress and capture future tasks. It also helped me manage the chapter structure as this changed a bit over time. It’s also good to track the word count (confirm with your supervisor what is expected), so you don’t waste time over-writing because you’re oblivious to your word count. Don’t buy everything you want to read! Check out the library of your teaching institute, especially for PW books of course (although if you’re referencing a PW book in your thesis, you probably want to own it). Custom Program Word’s Autocorrect function (not as difficult as it sounds). If you’re going to be repeatedly using a specific word that is difficult to type, or a long phrase (I was using “psychological freedom” a lot and I can hardly ever type ‘psychological’ correctly), program in your own custom Autocorrect function. For me that meant that every time I typed “pf”, Word would insert “psychological freedom” automatically for me. You can program more than one if you have several frequently used words/phrases. I also did it for ‘consensus reality’, ‘dreamland level’, ‘essence level’. Check out Google for tutorials on how to do this if you’re not familiar with it. Take your topic to therapy, and your writing process. Grounding your thesis in your own process is really helpful, and if you’re anything like me and you experience a lot of inner criticism about your thesis, therapy is awesome for this too. Have someone edit your work for typos before final submission (preferably someone with a good eye and good language skills). If you don’t have anyone, print it out and do it yourself by using a ruler to slowly read through the text line by line (the ruler goes under the line of text you’re checking and stops you reading ahead too quickly). If you’re not so savvy with Word, consider paying someone to do the final formatting for you – it might be no more than $200 (stab in the dark there) and could save you a lot of time and headaches. But if you do it yourself, sweet baby cheeses please fully justify your body text!! Doing your final thesis can be stressful, not just inherently, but because it’s a piece of work you have to submit to the public and so a lot of inner criticism and nerves can get constellated, AND because it’s usually the last step before finishing your Diploma (depending on your school’s Diploma structure) so the finishing/transitioning process of student-to-Diplomate is also in play. It can be a complex and rich time, so try to give yourself enough time in therapy to get the most out of it. Set up some support and hold yourself as gently as you can! Oh thanks Lynn – I wish I’d read it before I started mine too! I didn’t record page numbers when I first gathered citations so had to go back through everything I’d read and find the pages (that’s how I learnt the GoogleBooks tip), took a couple of precious days! !